At the following time, we have performed a version update of the PlayOnline Viewer. - Fixed an issue where an error message was repeatedly displayed when an unusable letter/character was entered in the friend list "Rename" function. - Fixed an issue where the "Start" button (which begins a GM chat) could still be selected even after receiving a knock message indicating that the GM chat has concluded. The PlayOnline version update will modify the "pol.exe" file. Certain security/anti-virus software may issue a warning, but this is a normal part of the version update process. If you are unable to log into PlayOnline due to "POL-0019" or "POL-1160" errors, please check your security/anti-virus software setting. There will be no PlayOnline server maintenance during this version update. The use of PlayOnline, FINAL FANTASY XI, and TetraMaster will continue as normal. - An issue where an error message is repeatedly displayed when an unusable letter/character is entered in the friend list "Rename" function will be addressed. The PlayOnline version update will modify the "pol.exe" file. Certain security/antivirus software may issue a warning, but this is a normal part of the version update process. At the following time, we performed a FINAL FANTASY XI maintenance. -An issue where the quest "Shattering Stars" could not be completed even after all the requirements were met. We ask that players who are scheduled to enter Dynamis or Limbus at the time of the maintenance wait until it is complete before entering. Please note that we cannot replace items that are lost during the maintenance process. We ask that those players who are scheduled to enter Dynamis or Limbus at the time of the maintenance wait until it is over before entering. Please note that we do not guarantee any items that may be lost during the period of the maintenance. At the following time, emergency maintenance was performed on FINAL FANTASY XI. This maintenance was to fully address the countermeasure against third-party software, which was applied during the maintenance on Jan. 13, 2006. -After the update that took place on Jan. 13, players were unable to obtain items by using the job ability "Steal" from some monsters in the following areas. This restriction has been removed. -Once the players obtain items from the monsters by using the job ability "Steal," items can no longer be obtained from them by using the same method. This restriction can be removed by defeating the monsters. -Changed the position of some monsters in Newton Movalpolos. It came to our attention that some players were using third-party software to repeatedly and automatically steal items from monsters in certain areas. Emergency maintenance was performed to address this issue. To counter this exploit, it is no longer possible to obtain items via the job ability "Steal" from certain monsters in specific areas. This measure is only temporary, and the issue will be fully addressed in upcoming days. We would like to take this time to remind our players that the use of any third-party equipment or software to change or modify the game in any way is strictly prohibited. If you come across such software, we ask that you please refrain from using it, no matter how minor it may appear to be. -Items that can be obtained via the job ability "Steal" have been removed from some monsters in the following areas. PlayOnline: New Information on Treasures of Aht Urhgan! New Information on "Treasures of Aht Urhgan"! The "Treasures of Aht Urhgan" website has been updated with new information on the upcoming expansion pack. Now you can check the site to learn about Mamook, where the Mamool Ja reside, and Arrapago Reef, home to the Lamiae and their malevolent swarms of undead. 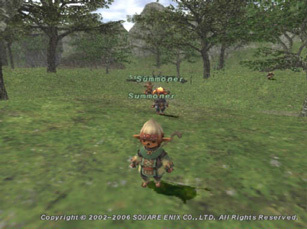 PlayOnline: North American Final Fantasy XI Xbox 360 Beta Begins! FINAL FANTASY XI Xbox 360 Free Beta in Stores Now! The February issue of Official Xbox Magazine has hit store shelves, and with it comes the free FINAL FANTASY XI beta! Players can grab the issue from their local retailers and be off exploring the world of Vana'diel in high definition in no time. Our previous beta resulted in many strong friendships that carried over into the launch of the game in North America. We hope to achieve the same level of excitement with the Xbox 360 beta as well. See you in Vana'diel! Visit the Official Xbox Magazine website for details. Today marks the opening of the North American Xbox 360 beta! The free beta comes packaged inside the February issue of Official Xbox Magazine which hits stands on January 17th. Once you've gotten hold of the game, head over to the registration website to obtain the codes to activate your account. Our previous beta resulted in many strong friendships that carried over into the launch of the game in North America. We hope to achieve the same level of excitement with the Xbox 360 beta as well. See you in Vana'diel! This is a followup to the previous announcement regarding the beta of the Xbox 360 FFXI. The registration website mentioned above includes a FAQ about the beta, including information on the current issues specific to the Xbox 360 FFXI, possible character transfers from the beta servers, etc. A wide range of additions and updates are reflected in this site update news. A number of older quests, mini-quests, and mobs from the July 2005 patch were updated or added; the corresponding July-August 2005 FFXI Patch Compilation of Info was updated as well, to reflect the changes. Food items from the most recent patch now have stats listed; those can be seen in an easy list within the updated December 2005 FFXI Patch Compilation of Info. Incidentally, a certain impetuous summoner, looking for a way to accomplish the arduous, onerous task of defeating Maat, called on Fenrir to read his fortune for the New Year. Unfortunately for him, Fenrir refused to listen, and ran outside of town instead! Won't you lend the poor summoner a hand and help him catch Fenrir if you see him? Fenrir claims that he just wanted to teach the inconsiderate little summoner a lesson, but apparently the avatar does plan to forgive him. This event is scheduled to commence on Dec. 31, 2005 at 07:00, and will last until Jan. 10, 2006 at 0:00 (PST). Like the New Year events in previous years, this involves various NPCs running around in outside zones. 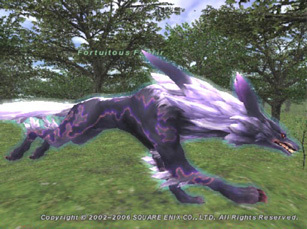 This time around, with 2006 being the Year of the Dog, we have the Fortutious Fenrir NPC, and three Summoner NPCs. You can trade the Summoner NPCs any item to randomly receive either a short duration buff, or a Rare/EX New Year's Gift item. If you receive the New Year's Gift item, you can use it, and it will be used up and provide you with a Fishing Enhancement buff. The cities are also decked out with various decorations to celebrate the New Year! - Modifications have been made in preparation for the upcoming Xbox 360 version beta test. - Fixed an issue where the screen and controls would freeze when certain pages were displayed. - Fixed various other minor issues.